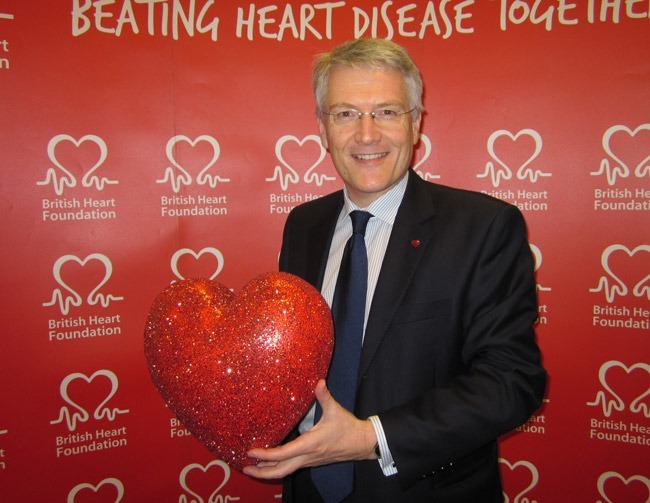 National Heart Month (NHM) is well underway for Harrogate and Knaresborough MP, Andrew Jones, who is running a campaign, throughout February, to raise awareness of heart disease. Last Thursday (7 February) Andrew won the British Heart Foundation’s (BHF) photo ‘tweet off’. Andrew had to tweet a picture of himself on Twitter, the online social network site, along with a message and compete with other MPs to get it retweeted as many times as he could. The tweet said: ‘Help the British Heart Foundation give heart disease the boot by supporting Rock Up In Red and retweeting this message’. Andrew said he was grateful to all those who retweeted him throughout the two day competition which enabled him to beat other MPs who took part in the competition. Andrew will receive his Valentine MP award for winning the competition, in Westminster on Thursday (14 February). Other activities Andrew has done so far for NHM include wearing a heart pin-badge during Prime Minister’s Questions and wearing red for a day in support of ‘Rock Up In Red’. Later in the month Andrew will be volunteering at the Beulah Street BHF charity shop on Saturday 16 February and visiting the Cardiac Rehabilitation Unit at Harrogate Hospital on Tuesday 19 February. He has also launched a ‘books drive’ for BHF. If you have any books that you would like to donate to BHF, you can drop them off at Andrew’s constituency office at 57 East Parade, Harrogate, HG1 5LQ or arrange for a member of Andrew’s staff to collect them by calling 01423 529614 or by emailing andrew.jones.mp@parliament.uk. Andrew, who spoke in Parliament in support of Leeds General Infirmary’s (LGI) Children’s Heart Surgery Unit for which he is a long-standing campaigner, says it is important that we raise awareness of heart disease, the UK’s single biggest killer. National Heart Month is a great opportunity to reach out to the community and alert individuals to their personal risk factors for heart disease. By getting involved in light-hearted events like wearing red and the tweet off I want to raise local awareness about the disease and help lead people on the path to prevention.